summary: An easy walk this one starting from the North of the Budawangs down to Styles Creek. From Wollongong, head south on the Southern Freeway (F6) and then Princes Hwy to Nowra. Continue south on the Princes Hwy through Nowra until the Kalendar Street intersection (near the Archer Hotel). Turn right on to Kalendar Street and then take the Albatross Road exit (the 2nd exit) at the roundabout. Head southwest on Albatross Road for approximately 7 kms. Turn right at Braidwood Road. Continue roughly southwest on Braidwood Road (around HMAS Albatross) for approximately 16.5 kms to the (recently upgraded) Turpentine Road (a.k.a. Nowra/Braidwood Road) intersection. Veer right on to Turpentine Road. Approx 16 kms past the intersection the Tianjara Falls lookout is reached. Continue roughly west along Turpentine Road for approximately 8 kms to the farm gate on the left side of the road that is the start of the access road (across private property) to the Sassafras entrance of Morton National Park. The farm gate is unmarked and is easy to miss if you do not know where it is. It is located at the top of the mountain, directly opposite an old slab and corrugated iron house. About 20 metres inside the gate (remember to close it) there is a small sign on the left indicating that this road is a public right of way. The track is followed south through private land for approximately 3.6 kms to the NPWS car park and a locked gate. There are a number of forks and closed gates along the track, stay on the main track and close the gates behind you. Leaving the vehicle(s) at the car park, head south along the fire trail for 800m to the NPWS camping area [GR 56H 249698 6107977]. This is our camp for the evening. 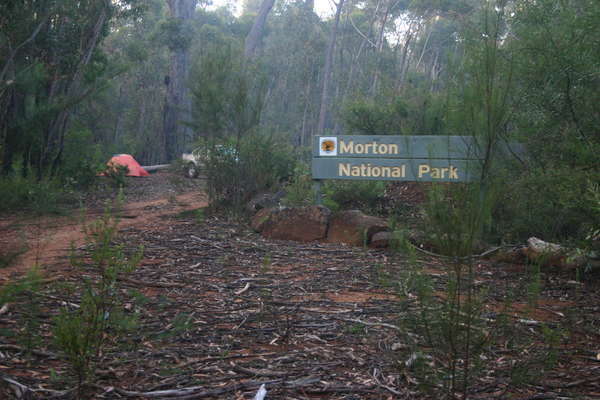 From the camping area continue south along the fire trail past Bhundoo Hill and Newhaven Gap to the 2nd NPWS gate. This gate is approximately 6.4 kms from the camping are and marks the former NPWS park entry. Continue on the fire trail, which turns south west. About 3.3 kms past the gate Camping Rock Creek is reached and just across the creek on the left side of the trail is the area known as Camp Rock. After another kilometer or so Red Johnny's Cave is found in the scrub on the left side of the track. Continuing on, the track enters The Vines rain forest area and the Quilty's Mountain turn off will be reached (~4.7 kms past the 2nd NPWS gate). Turn left and follow the track southwards [GR 56H 246333 6101026], uphill, for ~600 metres to the top of the small hill. From here there is a track heading west that leads to the base of Quilty's Mountain below the Aboriginal stone arrangements. Access to the site is via a narrow chimney to the left of the lowest ledge. From the top of the chimney we scramble up a series of ledges to the plateau and (try to) follow the meandering series of rock cairns to the stone arrangements. After visiting the site, return to the old timber haulers track at the top of the small hill. Follow the track roughly south west, downhill, over and under fallen logs. Three small creeks are crossed on the way down, before heading up a steep uphill section to the ridge between Sturgiss and Quilty's Mountains. A sharp eye must be kept for the track leading to Hidden Valley. The track is marked by some faint carvings in a fallen log and a tall tree fern. Continue past the turn off for about a kilometre to camp near Styles Creek/Swamp [GR 56H 243578 6098623]. The morning will be spent exploring Hidden Valley, Dark Brothers Cave, Sturgiss Mountain and Pagoda Rocks (see notes below). This will be with day packs only, with the aim to return to the camp (i.e. Styles Creek) for lunch. After lunch, the afternoon will be spent exploring the are around Styles Creek. This may include Mount Haughton, Mount Hoddle, and Mount Tarn (see notes below). Again, this will be with day packs only, returning to the camp at Styles Creek for the night. Return to the vehicle(s) is by reversing the route from day 1. A marked log lying beside the left hand side of the track indicates the route into Hidden Valley. After crossing a small swamp lying on the watershed between Styles Creek and Kilpatrick Creek, there is a short climb to a rock wall. This wall is followed northwards to where a break is found leading into the valley. Hidden Valley, probably discovered by Major Sturgiss, has a large swamp in it. At the southern end of the valley near the saddle is an overhang (Dark Brother Cave). Sturgiss Mountain can be climbed by following the wall just north the cave. A cairn marks the start of the ascent. Once on top, good views over Hidden Valley and Pagoda Rocks, and the swamp plains of Sallee Creek, can be enjoyed, whilst from the end of Sturgiss Mountain, Donjon Mountain and Shrouded Gods Mountain can be seen across Hollands Gorge. The north-eastern end of the mountain also offers good views. 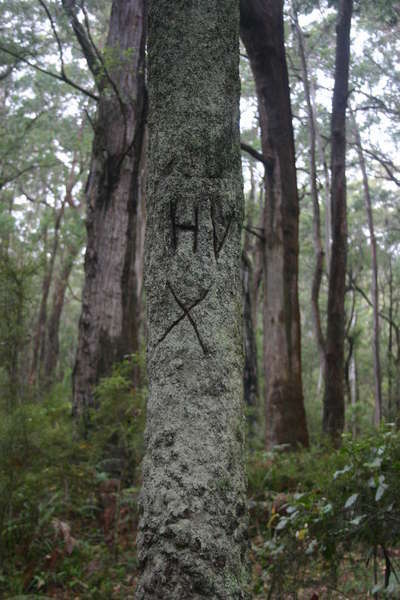 A log marks the track departure point with a stone cairn on it, as well as arrows and the initials 'HV' cut into the log. [...] The Hidden Valley track will lead you southeast into a rocky pass leading into Hidden Valley proper. The track is flanked with an understory of Banksias (B. spinulosa and B. paludosa) and Broadleafed Geebund (Persoonia levis) with wattles (Acacia longifolia) vying with bracken fern for light to survive. The valley is well protected by buttresses and cliffs on all sides and has a different Banksia (serrata) than the 'outside' world. This of course adds to its attraction, as does Dark Brothers Cave found about half a kilometre south of the entry point into the valley. An exciting and exposed climb up onto Sturgiss Mountain is available for those who don't mind heights near Dark Brothers Cave. The climb begins a hundred meters or so to the left of the cave, which faces west and involves a scramble up an indentation area aided by a length of chain. The chain leads to a right-hand ledge that stretches across the cliff face above Dark Brothers Cave. The ledge eventually tempers to become a series of ledges. After a series of scrambles upwards, [you] find yourself at the top of Sturgiss Mountain beside a cairn marking the descent. Traversing the summit plateau to the south is worthwhile, as the rounded domes and buttresses of Pagoda Rocks provide special views. Your return down the mountain is as for the ascent, although other conventional ways are possible. You may make use of some of the cracks and chimneys descending the cliff face near the southern end of [...] Hidden Valley, with the aid of a rope. [The track emerges] our of the bush in the headwaters of Styles Creek on an open, undulating, heath plain. The track once again begins to resemble the old timber getters road that it was and it crosses Styles Creek without ceremony. Once crossed, the old road can be followed for about half a kilometer before you have to diver to the south towards the closest (north-eastern) end of Mount Haughton, visible to the south some 2 km away. Directly in from of you lies a swampy area of some substance. It does need to be crossed as, oddly enough; it provides the easiest access to a camping cave at Mt Haughton. If a diversion is taken towards either Hoddles Castle Hill of the hill marked as '770' (ENDRICK 428973), this will lead to more swampy ground, incredibly thick scrub, and a longer route. A passage through the Styles Creek swamp can usually be found by paralleling the edge for a while and picking up and animal pad (path) that heads into the swamp. These can help you with the problem of avoiding wet feet or falling into overgrown channels. The crossing completed, ascend a ridge that drop away steeply to Hollands Gorge to the southeast, providing a magnificent view of the gorge and its surrounding peaks. The ridge line leading up westwards to Mt Haughton will be reached and a faint trail made by others will soon be detected leading up to the base of the cliff line. Once attained, the cliff may be followed to the right or left, as cavernous overhangs and water exist in both directions. Download GPX data for HIDDEN VALLEY.